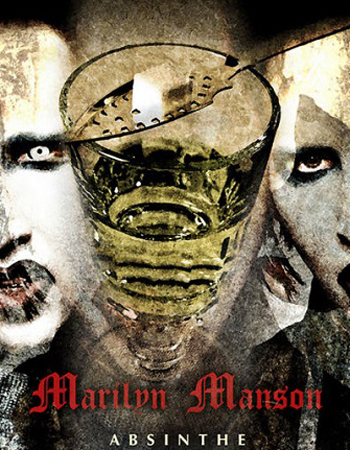 Mansinthe is the official Absinthe of the artist Marilyn Manson. Marilyn Manson is a fan of the Green Fairy. Therefore it fits well, that he launched his very own Absinthe, Mansinthe. His Absinthe is surprisingly of natural green color (not black) and has a devilish alcohol percentage of 66.6% by vol. With this strong liquor you can indeed travel to the "Golden Age of Grotesque". You can buy a bottle of Mansinthe online. We sell the official version, authorised by the artist. Worldwide shipping including the USA is offered. If you are interested as well in other strong Absinthe for sale, we can recommend Gothica, a powerful black Gothic Absinthe. It is super strong with an alcohol percentage of 80% (160 proof) and of course Gothica is made with real wormwood. The color of the spirit is not green, Gothica is purple-black and louches to a milky white color once ice-cold water is added to the drink. Both Absinthes are perfect to experience the vividness of the very special spirit "Absinthe". >> If you directly want to buy Mansinthe and Gothica online, just click on the link and you are forwarded to the Marilyn Manson Absinthe Set. Mansinthe is distilled in Switzerland by the family-owned Matter distillery. This distillery is specialized on the production of premium spirits. Some of the best Absinthes, which were already awarded at internaional spirit contests, are made by the master distiller Oliver Matter. Therefore Mansinthe can be regarded as one of the best Absinthes on the market as well. Although Marilyn Mansons music is in some sense extraordinary, you can say that his Absinthe is more of a classic Absynthe (alternative spelling). It makes uses of traditional ingredients like wormwood (artemisia absinthium), fennel and anise and adds some special other botanicals. Overall this Absinthe is balanced and not too licorice from its taste. Therefore professional and beginner absintheurs can enjoy this very special green alcohol. The label on the bottle shows an original artwork of Marilyn Manson. Yes, Manson is as well an artist, maybe the Green Fairy already inspired him for some paintings! Therefore get yourself a bottle of Mansinthe and experience what inspires Marilyn Manson! You could say that Absinthe and Manson are the perfect combination as both are unique and special. You can also say that Marilyn Manson really was one of the first persons to enjoy this unique liquor. Since 1998, the year when he as well began to paint - Marilyn Manson has been one of the world's most notorious connoisseurs of the legendary spirit, Absinthe. First referenced strongly as influencing the creation process of 2000's Holy Wood (In The Shadow of the Valley of Death). The album Golden Age of Grotesque in 2003 was Manson's homage to art, expressionism and late 19th Century Parisian decadence. Manson could scarcely be seen without a milky glass of the green spirit as his accessory. Also his former girlfriend Dita von Teese was associated with the drink, as she started to promote Burlesque dancing with her shows. Beginning in mid-2005, Manson has been quoted in the press about his desires to produce his own line of Absinthe and it was circa this time period when he started to get involved into the production of Mansinthe. Two years later, Mansinthe was finally released, a high quality spirit distilled from grand wormwood, anise, fennel and other fine herbs. Interesting info about Marilyn Manson and Absinthe: Before the creation of his own brand he drank Serpis Red. It is a Spanish Absinthe / Absenta with 65% alcohol. On some pictures you see him with a bottle of Serpis in the background. Marilyn isn't the only one drinking Absinthe. His whole band fell in love with the Green Fairy. If you want to read more about Absinthe and its effects, including the truth about the ingredient thujone, check out our info site. Where can I buy Marilyn Manson's Absinthe online? You can easily purchase a bottle of Marilyn Mansons Absinthe online. ALANDIA, our online store, is a very trustworthy and convenient place to buy this Absinthe. ALANDIA stands for the world of Absinthe, meaning that you can buy everything that is related to the Green Fairy in our store. We started our business in 2001 and proudly supply the Absinthe Community with real Absinthe. Our selection consists of some of the finest Absinthes available for sale. But you can also place an order for classic Absinthe spoons, Absinthe glasses and Absinthe fountains. We have it all. Check out our online store and get fascinated by the mystical world of the Green Fairy. We are quite sure, you will not regret it. If you are from the USA, you find some more information about ordering Absinthe (Mansinthe) on our info site Absinthe USA. Below you can see how you prepare Absinthe the traditional way. This is also the way how you should drink Mansinthe. You need an Absinthe spoon, glass, sugar cubes and ice cold water for the preparation. If you are very professsional you can replace the water carafe with an Absinthe fountain. As you can see in the video you should mix approx. 1 part of the liquor with three parts cold water. The video shows the classic French way of serving Absinthe. You should not drink Absinthe neat or set it on fire. This is dangerous and not the traditional way of drinking the Green Fairy.